Nominal capacity: 10Ah at 2A current (0.2C). Weight: 1690 grams. Always recalculate center of gravity changes! Expected battery life: >500 cycles. AMP Fastin/Faston connector. Other connector types on request. Maximum continuous discharge current: 10A. Capacity at 10A current around 8,5Ah. Requires a special NiMH battery charger! Click here. Recommended normal charging current: 1A. Maximum charging current 5A (not recommended to ensure longer battery life). Highly recommended for lower-current instruments like navigation, e-variometer, transponder, radio. Also suitable for turbo-operation or occasional bugwiping (max 10A). NiMH (Nickel–metal hydride) is safe to use on board, just like lead or LFP batteries! We spot-weld and pack these battery packs ourselves. 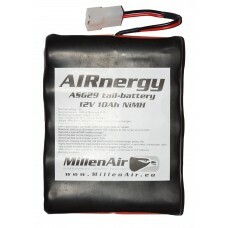 They are made out of the highest quality German manufactured 10.000mAh NiMH battery cells. We DO NOT use cheap unbranded batteries! 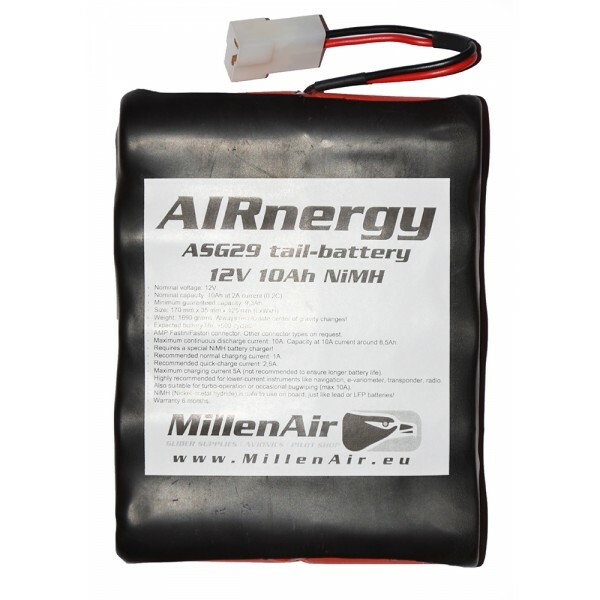 We normally keep only very low stock numbers to ensure that the batteries are as fresh as possible. This however may sometimes result in batteries not being in stock. The delivery time should normally then be less than a week, but the benefit is that you will receive brand new batteries. We guarantee that the batteries we have in stock are not older than 3 months, and are stored properly indoor (18-20 degrees). This will ensure that you can trust to receive high quality, fresh batteries from us - MillenAir Glider Supplies - Avionics - Pilot Shop.